Hair Mineral Analysis by Hair Mineral Analysis at Bijc. MPN: 5000. Hurry! Limited time offer. Offer valid only while supplies last. Hair Mineral Analysis is an important tool for maintaining optimal health as it shows deficiencies in minerals and toxicity induced by heavy metals. Hair Mineral Analysis is an important tool for maintaining optimal health as it shows deficiencies in minerals and toxicity induced by heavy metals. Hair is the second most metabolically active tissue in the body. The hair tissue is affected by the blood, perspiration, environment, genetics, hormones and enzymes. The hair represents what is occurring inside the cells and the submolecular figures of the body. A blood test shows what is happening outside the cell and the waste material being discarded. The hair gives a reading of what is being stored in the body. For example, if mercury is high in the hair, a higher concentration of it would also be found in organs like the kidney and liver. A hair analysis gives a complete picture of a person's health history. 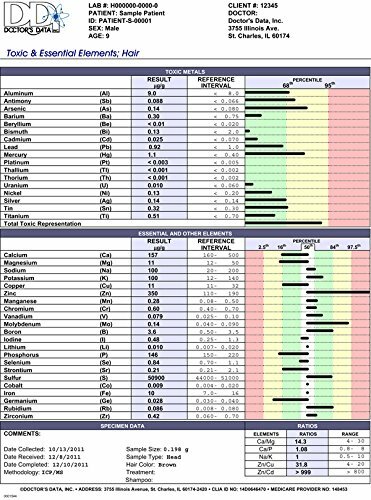 Our hair analysis test can indicate vitamin, mineral and nutritional deficiencies as well as heavy metal toxicity have occurred over a long period of time. All minerals need to be in balance for optimal health. For instance if calcium and magnesium are too low you may have muscle twitches or trouble sleeping. If sodium and potassium are too high you may have hyperactivity. If our hair analysis test indicates that there is an elevated mineral toxicity, this means that your minerals are getting stuck in the connective tissues, instead of being utilized by your body. The key is that ALL of your minerals need to be in "balance" with each other so they can nourish your body properly as they are supposed to do. Dyed hair can cause false positive results of certain elements. After you check out, we will send you a kit. You then send it back to us with a hair sample. After about 2-3 weeks you will receive the test results with a short explanation of abnormal elements by the laboratory. Dyed hair can cause aberrant test results . RETURN POLICY Unused kits can be returned.Shipping will only be refunded if we made a mistake. If you have any questions about this product by Hair Mineral Analysis, contact us by completing and submitting the form below. If you are looking for a specif part number, please include it with your message.